We were very sad to learn that Hilda Hadley passed away this morning. She was well known to many members of CCHS. 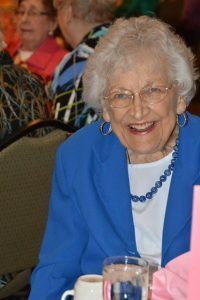 She was a past president of the society, and we recognized her dedication to Carmel’s history with our Heritage Award in 2015. She was an extraordinary person who lived an interesting and useful life. We here at CCHS will miss our dear friend. Visitation will be at 10am on Saturday, July 8, at Carmel United Methodist Church. The funeral service will follow at noon at the same location. OMNI Centre for Public Media released the video below about Hilda just last month. It is a fine tribute to a beloved Carmel resident. The Current recently published an interview with Hilda. You can find it here. I came to know Hilda through my wife Sherry Bryan Murray and their shared love of Zeta Tau Alpha fraternity. We were also members of Carmel United Methodist Church where Hilda was a much beloved member. She will be truly missed but God just welcomed a very talented member of his heavenly choir. Move over altos, make room for Hilda. I became aware of Hilda when our family was a member of Carmel UMC. During that time my wife, Sherry Bryan Murray, and Hilda discovered that they were both members and shared a deep love of Zeta Tau Alpha fraternity. That relationship grew over the last 35 to 40 years. Hilda will be missed but I know that God has gained a member of his heavenly choir. Move over altos, make room for Hilda. Dear Hadley Family, Hilda was a dear sweet friend & sister in our beloved Zeta Tau Alpha, & influence in my Christian faith. She was a role model in life since I met her in the 80’s. I will miss her. I’m so glad I saw her & had a chance to talk this last week. God’s Speed my Dear Sister.